Blue is my favorite color, but this is not my favorite block, and I'm not sure why. It may be that I don't like that orange leaf button in the button cluster, though I think it'll look better when it's across from the orange block. However I am open to suggestions on ways to improve this; whether they have to do with the orange leaf or some other component. It's a pretty block. I would probably use a white or silver button but that's just me. Janet I really love the colors in this blue portion of the color wheel...and I think it looks pretty the way it is but if anything i agree with Gerry maybe silver would compliment it nicely. 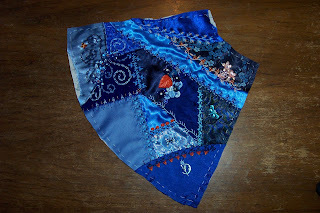 Janet your block is gorgeous, and I love the wedge design. If you do not like the orange leaf, what I have done in the past is to take a small makeup sponge and or permanent marker and dust in the veins on the leaf, it will darken it and I would not hesitate to use a blue rather than a dark black or brown. It is truly beautiful.